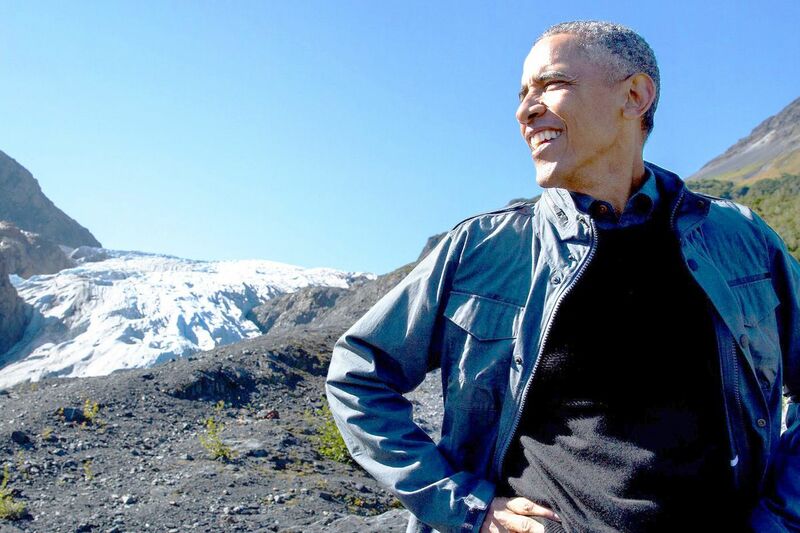 A year ago, President Obama stood at the toe of retreating Exit Glacier and proclaimed it a beautiful but vulnerable sight, an obvious "signpost" of climate change. "We want to make sure that our grandkids can see this," he said then during a Kenai Fjords National Park tour that was part of the unprecedented presidential trip to Alaska. Now Exit Glacier is even farther away from the spot where the president stood. Thawing over the warm spring and summer has eroded the ice. 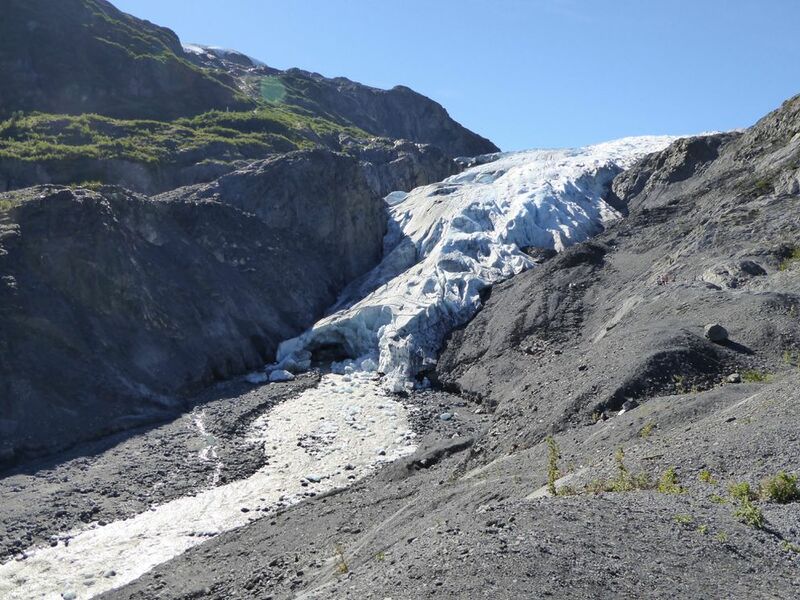 Several weeks of late-summer rain may have further thawed the glacier; large chunks have cleaved away from the glacier's face in the past month, being tossed downstream and exposing a cave-like opening at the base of the terminus. And the spot where Obama stood to view the glacier's blue ice is now mostly underwater, site of a new stream created by glacial melt. If Obama were to return, he would be struck by the changes, said Sharon Kim, chief of resources at Kenai Fjords. "It is so different than what he saw before," Kim said. In recent weeks, the transformation has unfolded day to day, she said. "If you're there on a daily basis, I think you're actually able to track the change that's taking place," she said. Earlier in the week, for example, she saw and heard the glacier calving — a common occurrence at tidewater glaciers that flow into the sea but not common at Exit, which spills out onto land. Exit Glacier has retreated about a mile in the past 100 years, according to park scientists. Last year, according to end-of-summer measurements, it lost about 136 feet. This summer's retreat has yet to be quantified but it is clearly dramatic, Kim said. Park staffers plan to take measurements later this month to determine the actual retreat, she said. Usually, that September project is done on the ground, with staffers going on foot to get precise information about how much bare ground has been newly exposed by the melt, she said. This year, that process might be more challenging: If the terminus area is still underwater, the park might have to rely on aerial photographs as a backup, she said. The Exit Glacier measurements are part of a Kenai Fjords monitoring program that tracks changes in the Harding Icefield and the glaciers that spill from it. Measurements of the icefield, taken each spring and fall, are also planned for later this month. Exit Glacier's melt causes some obvious effects down the road — literally. 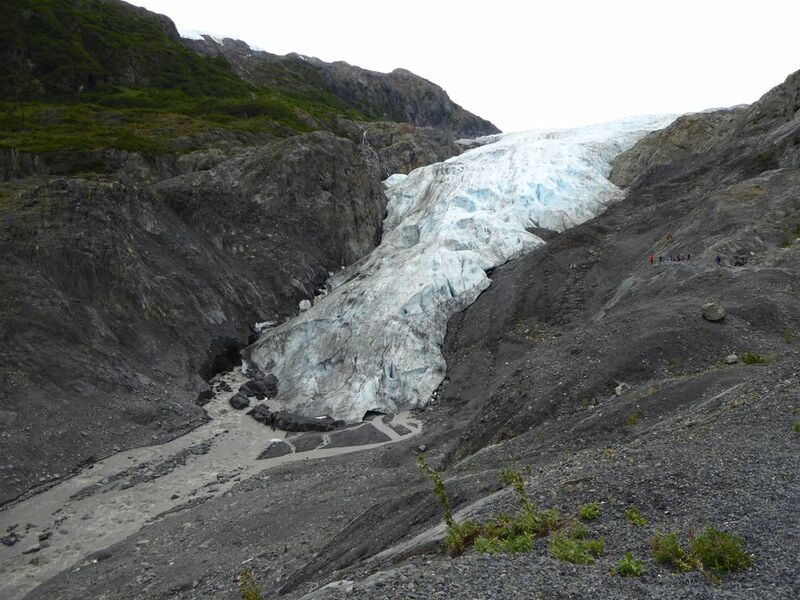 Due to the accelerated melt, the access route used by visitors to get to the glacier is now subject to frequent floods. In the past, flooding occurred occasionally and was usually associated with fall rains that swelled the Resurrection River, but with glacial melt adding to the water load, flooding is now a near-annual occurrence, officials say. The road sometimes floods in the summer, disrupting access to the popular drive-up glacier during peak visitor season. In response, the U.S. Department of Transportation and the National Park Service have started a project — intended as a long-term solution — to raise a section of road and improve drainage around it. Construction is underway this summer to raise a section of the road by 5 feet. The $2.9 million project, undertaken by DOT's Federal Highways Administration, also involves new culverts to divert flowing water.